Zahra Khanum poses in her Miss Singapore Universe 2018 costume on Thursday (Nov 29). 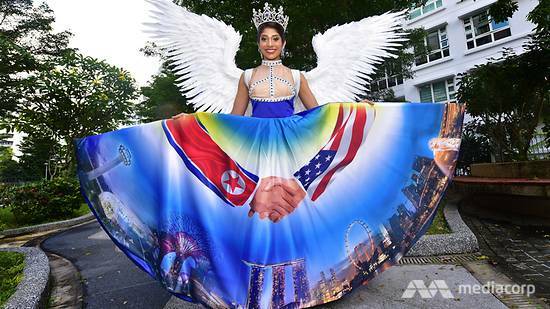 SINGAPORE: The man behind Miss Universe Singapore’s controversial Trump-Kim Summit costume has spoken out in defence of his design, saying that he is “happy with the final result”. 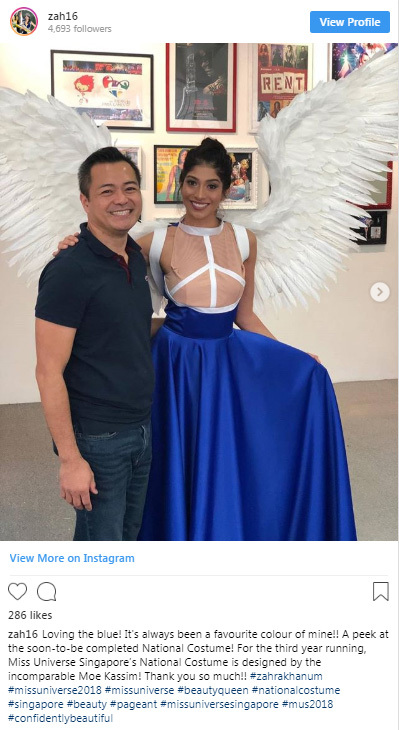 The national costume - designed by Mr Moe Kasim of Moephosis Concepts in collaboration with Miss Universe Singapore national director Nuraliza Osman - has drawn much reaction on social media since it was unveiled on Thursday (Nov 29), with some questioning how the design is representative of Singapore. Inspired by the historic summit between United States President Donald Trump and North Korean leader Kim Jong Un in June, the dress features an electric blue skirt that fans out to reveal a hidden surprise - a huge digital print depicting the historic handshake between Mr Trump and Mr Kim. Miss Universe Singapore representative Zahra Khanum will parade it at the Miss Universe 2018 pageant in Bangkok next month. Mr Kasim told Channel NewsAsia that he was instructed by organisers to “design something based on the Trump-Kim Summit”. “I naturally thought of world peace and the elements of it, hence, the design,” Mr Kasim said in an email interview. The Trump-Kim dress represents the third consecutive year he has designed Miss Singapore's national costume. He added that he believed the organisers wanted to highlight “what was relevant, current and unique – something that was probably only going to happen once in our lifetime and in Singapore’s history”. “We accepted the design challenge in the spirit of supporting Singapore’s role in promoting world peace, friendship and unity,” Mr Kasim said. “This is just a representation of what Singapore stands for, which is world peace, and the fact that Singapore is reaching out to other countries to create positive relationships,” he added. 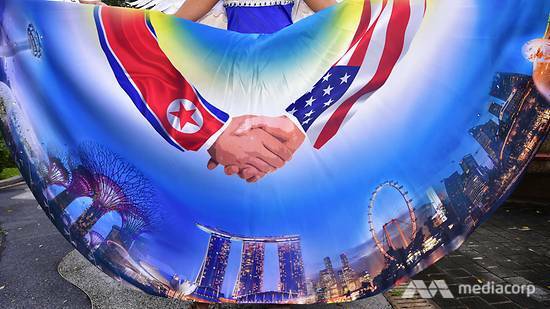 Most of the criticisms surrounding the dress were centered around the choice of the Trump-Kim Summit as a design inspiration, the use of North Korea and US flags on a national costume representing Singapore, the absence of a Singapore flag, and the perceived inferior quality of the digital print. Mr Kasim said that among the challenges he faced while making the costume was the budget. “It was a challenge to design something based on an event. Even more so for something as controversial and contentious as this one,” Mr Kasim said. “Budget was also another challenge. We had to make the best with what we have. I’m happy with the final result and I wish everyone will join me in cheering for Zahra at the finals now that the spotlight is on her, even from the international media,” he added. Mr Kasim also addressed comments by some who suggested that the Trump-Kim dress has similarities to Miss Turkey’s 2015 national costume, saying that any resemblances was a mere coincidence. “Honestly, I’ve never seen the 2015 dress until it was pointed out,” Mr Kasim said. “There has been thousands of costumes showcased over the years and it’s hard to keep track of them all. It’s purely a coincidence,” he said. The Miss Universe 2018 pageant will be held in Bangkok, Thailand on Dec 17.